Did Christine contact anyone other than "Q" while at the farmhouse? Didn't she have contact with her sister, Jennifer, on the 10th??? So JR and Christine had a fight? How long was the drive from Christine's mothers house to the farmhouse? Thanks. One other question, do you know how far of a drive it was from the Walmart Christine was picked up at to the farm? From the walmart here in Pocomoke it's only about 1 mile to the farm. But.. that's not the walmart she was picked-up from. I asked on the Blink site why didn't "Q" just take Christine the rest of the way to the farm because it was so close, Blink replied that Christine was not dropped-off at the Pocomoke walmart. But... unless I missed it somewhere I have not read what walmart they did meet at, I did ask but didn't get an answer. was it in Delaware, Salisbury, Fruitland? walmart is everywhere. Jimmy's last name is Quail and Christine called him "Q". So I guess it is possible that JR called him Q, too. yes, that is what I remember...that it was not the Walmart in Pocomoke. And I, like you, wondered how far the Walmart was from the farm because I'm sure Q would have taken her directly there...unless *someone* didn't want him to go to the farm. Mytime - thanks for bringing the Tattler posts over. I really wish they had dates on them. I'm sure that even Christine's mom found out more and/or different info as time went on. Sorry, let me re-phrase that. RE: the above screen capture, it says "He called Jimmy "Q" to let him know that he and Christine had a fight" - does that mean that JR called Q? I read it that way too and I thought it was an odd call to make....setting the stage kinda thing. There is so much that just doesn't make any sense....and I still cannot believe LE thought she simply ran away. There is nothing so far that would lead me to think for a second she just ran off. Good evening, yes, he did call Q at around 5:30 pm on the 13th to tell him that Christine just left and left the boys there alone while they were out picking up Tia's children. Q had called Christine on his phone at around 11:00 am that morning and Jr. lied and said he was out, had little cell phone minutes and would have her call when he got back in. But, according to videos the neighbors took, Jr. did not leave the farm until 2:38 pm that afternoon. Me either Leroy -- have you seen what was said by this jerk the Mayor -- I am spitting fire that any human being can be treated or talked about this way and it was someone he knew nothing about. Judge Not, Lest You Be Judged. See below -- I copied from Blink's site. Good evening by the way -- I am so sorry but I am so mad by this. Mayor McDermotts words to me were “you all are totally off base with this Christine Sheddy case on the Tattler”. He said that he had sources that said that she had run away, and abandoned her children. I told him that I didn’t believe it for a minute. That as a mother, there was no way I could accept that. He again told me that we were off base, and if she were found tomorrow she would be arrested for child abandonment. I said “Mike if it was your daughter you would be screaming it from the rooftops and turn the world inside out until you found her”. He said, “Stephanie, these are people that you would never associate with.” “She was a sponge on society. No one knew she was missing because she wasn’t expected to be anywhere because she didn’t have a job”. I told him I didn’t care what kind of person she was, that whatever she did, did not require a death sentence. He again told me that we were off base in saying these things on the Tattler, and we should just not write about it anymore. I told him that I would never stop writing about it until the case was solved. I also told him that I hoped that if my then unemployed daughter came up missing that he wouldn’t take the same position with her. Read this post by Jennifer - how could LE believe she ran away? Hey Mytime -- How are you tonight? I don't know how anyone for the first minute thinks she ran away. I cannot beleive how badly Jennifer and Lynn have been treated. Makes my heart break for them and makes me really po'd at those who were charged with serving and protecting. So now the question is who wanted to meet here...I mean, JR & Tia do not seem like the kind of people who would do anything for anyone unless there was something in it for themselves. But it sounds like Q would have done anything for Christine. So who's idea was it for them to meet at a Walmart an hour and 1/2 away?? Surely Q would have driven her the entire way since he was her back-up plan on the 13th. And Steve Magg is the one who took Christine to the farm prior to this. So no one that Christine would have trusted ever went to this farm house. Feel free to remove if not correct. 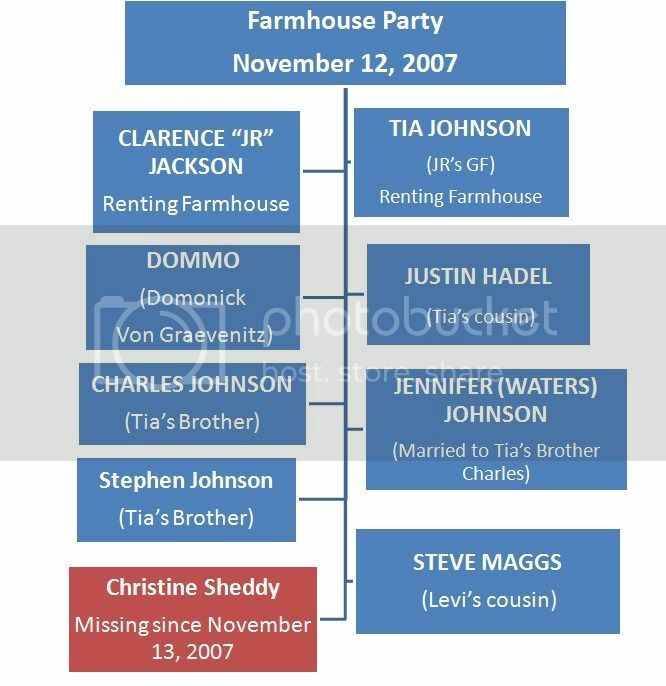 I thought this might be of help to know who attended the Farmhouse Party that night. Thank You, I forgot about this. Soooo much to remember! The so-called City Officials there, are NUTS!!! I've been reading about Honnis, McDermott, Russ Blake - Oh My!!! Page created in 6.213 seconds with 20 queries.